Personalized membership card that grants one admission to the Uffizi Gallery and the following museums and historic sites in Florence, Italy: The Uffizi Gallery, The Pitti Palace, The Palatine Gallery & Royal Apartments, The Argenti Silver Museum, The Gallery of Modern Art, The Costume Gallery, The Porcelain Museum, The Boboli Gardens, and The Bardini Gardens. Private tour of the Uffizi Gallery and Vasari Corridor with art historian. 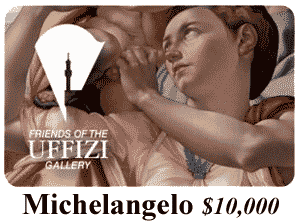 Private viewings of special exhibitions at the Uffizi Gallery.